Enter online at HockeyHappensHere.com for a chance to win* one (1) of four (4) trips for two (2) to an outdoor NHL hockey game, including the 2014 Bridgestone NHL Winter Classic. Prize includes tickets, flights, and hotel. *Must be 21 years of age or older. No purchase necessary. Skill-testing question required. Four (4) prizes available to be won, regionally allocated as follow: 1 in BC, 1 in AB, 1 in MB/SK, and 1 in the East (PQ, NS, PEI, NB, and NL). Each prize is worth approx. $5,000.00 CAD. All entries must be received by 12:00 PM (ET) on December 14th, 2013. For full contest details visit http://www.hockeyhappenshere.com. 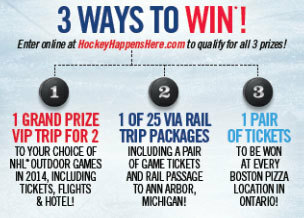 Enter online at HockeyHappensHere.com for a chance to win* one (1) of three (3) trips: a trip for two (2) to an outdoor NHL hockey game, including the 2014 Bridgestone NHL Winter Classic, including tickets, flights, and hotel; a trip for two (2) to the 2014 Bridgestone NHL Winter Classic, including tickets, rail transportation, and hotel; or two (2) tickets to the 2014 Bridgestone NHL Winter Classic. *Must be 21 years of age or older. No purchase necessary. Skill-testing question required. Total of one (1) Grand Prize avail. to be won, worth approx. $5,000 CAD. There are 25 Secondary Prizes (each worth approx. $3,000 CAD), and 107 Primary Prizes (each worth approx. $250 CAD) avail. to be won. All entries must be received by 12:00 PM (ET) on December 14th, 2013. For full contest details visit http://www.hockeyhappenshere.com. WHERE TO ENTER: Text "EPIC" to "25858"
Text the word "EPIC" to "25858" to earn one (1) entry into the contest for a chance to win* four (4) tickets to the 2014 Bridgestone NHL Winter Classic, including hotel and airfare to and from Ann Arbor, Michigan (BC, AB, SK & MB and the Atlantic); text the word "EPIC" to "25858" to earn one (1) entry into the contest for a chance to win* six (6) tickets to the 2014 Bridgestone NHL Winter Classic, including hotel and airfare to and from Ann Arbor, Michigan (ON and PQ). *Must be 21 years of age or older. No purchase necessary. Skill-testing question required. Standard text messaging rates may apply. 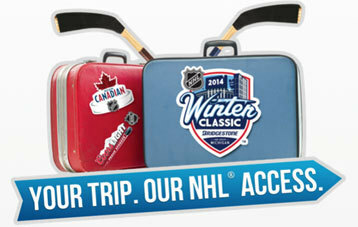 One (1) Prize (Trip for four (4) to the 2014 Bridgestone NHL Winter Classic®) avail. to be won, regionally allocated as follows: 1 in BC, 1 in AB, 1 in SK/MB, 1 in the Atlantic (NS, NB, PEI & NL), [and One (1) Prize (Trip for six (6) to the 2014 Bridgestone NHL Winter Classic®) avail. to be won, regionally allocated as follows: 1 in ON and 1 in PQ. Each Prize worth approx. $10,000.00 CAD. Contest ends at 12:00 PM (ET) on December 10th, 2013. Find a PIN card in specially marked cases of Molson Canadian and Coors Light, or at select on-premise accounts. PINS can be entered online at http://nhlepicexcursion2013.molsoncoorscontests.com/en/Landing.aspx for a chance to win* and select one (1) NHL Epic Excursion of his/her choice from a list of 32 predetermined trips two (2) trips to the 2014 Bridgestone NHL Winter Classic are included in this list). There are also ten (10) secondary prizes of one (1) trip for two (2) to the 2014 Bridgestone NHL Winter Classic including tickets, flights, and hotel. *Must be 21 years of age or older to participate. No purchase necessary. Skill-testing question required. Total of 2 grand prizes, each worth approx. $25,000 CAD. There are 10 secondary prizes to be won, regionally allocated as follows: 3 in ON, 3 in PQ, 3 in the Atlantic, 1 in the West, each worth approx. $5,000.00 CAD. All pins must be received by 12:00 PM (ET) on December 12th, 2013. For full contest details visit http://nhlepicexcursion2013.molsoncoorscontests.com/en/Landing.aspx or call 1-800-MOLSON1. 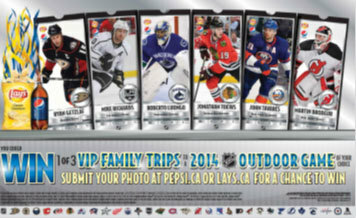 Upload a unique photo sharing your outdoor hockey experience for a chance to win* one of three grand prizes which includes a family trip for four (4) to the 2014 Bridgestone NHL Winter Classic, the 2014 Tim Hortons NHL Heritage Classic or one of the 2014 Coors Lights NHL Stadium Series Games. *No purchase necessary. Internet access required. Contest open to legal residents of Canada, age of majority or older. Mathematical skill-testing question required. Contest ends 12/07/2013 at 11:59:59PM. Draw date 12/10/2013. Limit one (1) entry per person per day. Three (3) Grand Prizes available to be won. Maximum approximate retail value $8,100 CDN each based on a sample Toronto departure. Odds of winning depend on the total number of eligible entries received. Condition/restrictions apply. For full prize details, Contest Rules and to enter visit http://www.pepsi.ca or http://www.lays.ca. Visit NHL.com/york and register for a chance to win* one (1) trip for two (2) to the 2014 Bridgestone NHL Winter Classic, including hotel and a $500 prepaid gift card. One grand prize winner in US and one grand prize winner in Canada. *NO PURCHASE NECESSARY. A PURCHASE WILL NOT INCREASE YOUR CHANCES OF WINNING. For full rules, how to enter and complete prize description visit http://www.nhl.com/york. Starts at 10:00:01 AM ET on October 21, 2013 and closes at 11:59:59 PM ET on December 17, 2013. 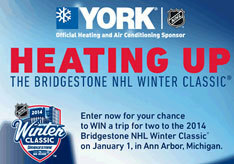 2 Grand Prizes available to be won (1 for residents of Canada and 1 for residents of the US), each consisting of a trip for 2 people to the 2014 Bridgestone NHL Winter Classic® on January 01, 2014 in Ann Arbor, MI (approx. retail value $3,000 USD). 2 random draws will be held on December 18, 2013 in Toronto, ON. Open to legal residents of Canada, the 50 United States and the District of Columbia who are 21 years of age or older in their province or state of residence. Odds of winning depend on the total number of eligible entries received from each of the US and Canada, respectively. Limit of 1 Registration Entry and 1 Bonus Entry per person. Correct answer to mathematical skill testing question required (Canadian residents only). Sponsors: NHL Enterprises, L.P., NHL Enterprises Canada, L.P. and York (Johnson Controls, Inc.).